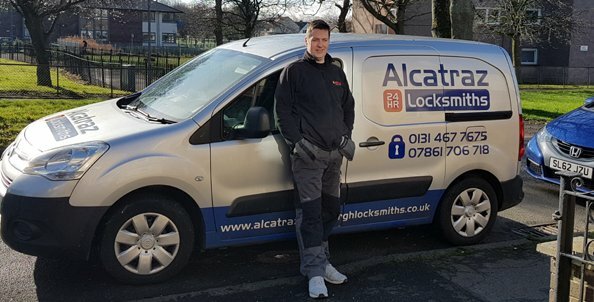 If your searching for a trusted ‘locksmith Currie’ service, look no further than Alcatraz – Edinburgh locksmiths. We are a friendly and professional company, with a wealth of experience in the locksmith world. Our philosophy is to provide an excellent service, coupled with an affordable prices. No one enjoys having problems with their locks. Being locked out a property generates anxiety in most people. Not only do you have the worry of sorting the things out. You may be concerned about how much a tradesman will cost. With Alcatraz you needn’t fret about the cost of us coming to you. We never charge a call out fee; even if it is 4 o’clock in the morning. With us, you only pay for the work we tackle. Further more, you can be assured we are the cheapest firm around by far. We constantly check and tweak our prices, which enables us to provide the cheapest service around. We provide a comprehensive service to the Currie area, 7 days a week, 365 a year. Your call will always be answered, no matter what the time of day or night. If we cannot attend due to unforeseen circumstances, we will source you a respected company, such as the one’s in the locksmith directory. Most of these companies have trained master locksmiths who are fully licensed and insured, meaning you are in the best hands possible. When calling us in an emergency situation, we will strive to reach all parts of Currie and Juniper green in around 20 minutes. We are based in the west of Edinburgh, so you can be assured your calling a local firm – not a national call centre. They charge extortionate prices for all jobs undertaken, and the service they provide is no different from what a local firm delivers. At Alcatraz – Edinburgh locksmiths we charge a fraction of their prices, and never add VAT on at the end. Upgrading locks to meet insurance specifications. This is a very important service we provide. Most people don’t realise the insurance policy they pay every month is void. This is due to their current locks not meeting the minimum security standards stated in the policy. Changing locks is something we do on a daily basis. Usually locks are changed when keys go missing, or people move to a new property. We can provide a full array of locks, from budget solutions to high specification locks. On site key cutting is a service we provide for your convenience. Although you would expect to pay more for a mobile locksmith to cut keys – this is not the case with us. If we fit a lock to your property we will offer to cut new keys for around £5 per key. The more keys you get cut, the bigger the discount we offer. Emergency locksmith service – which is provided around the clock, every day of the week. UPVC door and window repairs are provided by the specialists at Alcatraz locksmiths. We are able to repair the majority of issues relating UPVC doors and windows very immediately. However, we carry an extensive range of replacement parts in the van just in case . Therefore, your lock issues can be concluded sooner rather than later. Commercial locks are somewhat of a speciality of ours. Whether it be a new shutter lock or perhaps a mechanical code lock, we can resolve any commercial lock issues.